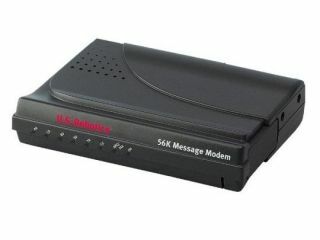 Who still uses 56k modems, and why? Rumour has it that a lot of top-level businesses keep one piece of ancient kit in their vaults – a 56k modem. Contingency perhaps, but now everybody is on broadband it's somewhat superfluous. Or is it? Far from being a complete rarity, there are still many people using their 1990s black boxes, complete with familiar white noise. We spoke to some, as well as an ISP still offering dialup, to find out why. "The reason I stuck with dial up for so long was that I live in a rural area with an exchange which so far has not been unbundled for any providers apart from BT," explains Chris Angus, 70, from Wing in Buckinghamshire. "No cheap deals were available to me. Various friends in the village did use broadband but could only achieve speeds of 0.5 Mbps maximum on a good day! My dialup provider was Firefly. They were very reasonable and available 24 hours [a day] at the same price." So how many people still use dialup? We asked Tiscali's Jody Haskayne to find out. "We do still have about 150,000 dialup customers, most of which are pay as you go, which makes sense as a broadband subscription is cheaper than a dial-up one now. We offer a free accelerator product also, which certainly boosts the usability." "I would say that 99 per cent of our customers on dialup could, if they wish, upgrade to broadband and we do email them on a regular basis to offer upgrades, but if someone only uses their internet access for a few hours a month and don't do anything that requires a fast connection, then dial up can be sufficient." We'd heard that 3D World forum user Hermit was on dialup, so we asked him why. And it seems there is a sizeable minority in the same category. "It's because I'm tight" he replied in a post on the forum. Will he get it eventually? "'Eventually' is a safe bet there, but eventually can be a long, long, time." He did, however, admit that he didn't really enjoy the speed. "It's slow, it's bad, it's dialup. In June, next year, my dial-up modem will be 10 years old. It's been a real trooper has that modem." "I still keep getting emails from my ISP asking if I want to change over to broadband. I think I'm starting to grate them," he admits. "But, this is a war of wills, they'll either have to throw me off or offer me a cheaper rate broadband." "Until six days ago my 69-year-old mother was on BT dialup. As of the end of last week she moved onto broadband and she set up the router herself," replied fellow forum user Dr Monkeyface. "Now I don't need to go look at her Cross Stitch sites to tell her what shade of blue she needs on her current work." But 56k might not have such a long life as many would expect. Dutch telecoms provider KPN is axing dial-up and shifting everybody to broadband. Nice. "Of course when you look at the bundles (double and triple play) that are available on LLU (Local Loop Unbundling), where you get free line rental and inclusive calls, then broadband is overwhelmingly compelling," says Tiscali's Haskayne. She also suggests scenarios where people switch to dial-up accounts to protect email addresses when people are out of the country, for example. But 56k dependency isn't just prevalent in the UK. "Every summer, I spend two or three weeks at my family home in Northern Ontario, Canada," says Andrea Robinson, who responded to TechRadar's plea for dialup users to get in touch. "Even the simple receipt of an email necessitates hours of planning – particularly as it ties up the phone for the entire time." "A friend made the 'mistake' of emailing me a photo during one of my holidays – and after spending hours watching the server try to download the message at the rate of one bit per hour (or something like that) we had to make an emergency trip to the local village to use a payphone to call the (very helpful) ISP and get them to delete the message!" "There's nothing more infuriating than sitting watching a Yahoo mail page appear onscreen one pixel at a time, so nowadays I just tell people I'm not contactable while I'm there, which is pretty much the case. In a way it makes it more of a vacation as it completely forces me to change my routine and waste less time online." However, in the UK, more exchanges are being unbundled all the time and performance is increasing to boot. Chris Angus now has broadband, after a speed increase was reported in the village. "I did a download speed test and they promised a connection speed of 3.5 Mbps.I was connected within five days and now achieve 4.4 Mbps – the fastest in the village. I am very happy and can even use Google Earth!" Oh, and one more thing. When we asked Hermit if he could send TechRadar a picture of himself, he replied with the classic line. "I would, but I'm on dial-up."